From 1920 through 1940, New York photographer Edward J. Kelty toured alongside America's greatest circuses. Outfitted with a custom large-format camera and mobile studio, he set out to capture the men, women, oddities, and animals behind the greatest show on earth. 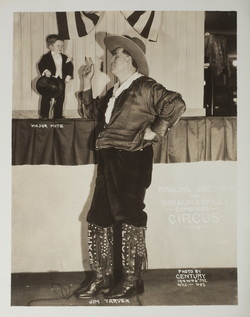 Today, E. J. Kelty's work is regarded among the best records of the American circus. He is especially noted for his striking portraits of sideshow performers, like Jim Tarver, the Texas Giant, and Major Mite, the world's smallest man! Kelty is also known for a series of yearbook-style photographs depicting each member of the sideshow.These images, sometimes titled The Congress of Freaks, were produced for Ringling Brothers and Barnum & Bailey, Coney Island, Hagenbeck-Wallace, Sells-Floto, Clyde Beaty, Hubert's Museum, Dreamland Circus, Harlem Amusement Palace, and many other shows. This website is an attempt to share my growing collection of E. J. Kelty photography, related material, and ongoing research in the field. I am always interested in seeing and/or purchasing individual examples or large groups. If you know the whereabouts of other Kelty photographs or related material, please contact me at Derin@DerinBray.com.